Like everyone else I have had my challenges with the Prayer. For quite a while I was frustrated with the level of focus and khushu’ that was at best slim. Therefore, I understand the dissatisfaction some of you feel towards their level of khushu’. At one stage of my life I came to a tentative conclusion that some people were destined to have more khushu’ than others, that some were born with the tendency to develop khushu’ while others were not. Unfortunately, I thought I was among the latter! However, Allah has blessed me with a persistent and annoying dissatisfaction with lack of focus and khushu’ in my Prayer, that it was easier for me to do something about it than just to live with it. When that point of transformation tipped I found myself gravitating to lectures and books that focus on one’s inner experience of the acts of worship. So I let myself delve into a world that I had thought I knew well, but it turned out I was mistaken. I realized I had not allowed myself to open up to the deeper meanings of what I had been learning in the past. I started to discern the difference between merely knowing about something and actually knowing it! I came to realize later that our comprehension of things is far more nuanced than most of us realize. Knowing something at a deeply spiritual level is a completely different experience than knowing it at an intellectual level. At the time I was reading the book “On Becoming a Leader” by probably the top authority on leadership Warren Bennis. He said something that left me flabbergasted for a few days trying to absorb the notion. He clarified that learning was not merely knowing, but being. This was a an epiphany! Soon I grew to realize that lack of khushu in the Prayer was actually my fault, and that if I wanted I could actually take it to the next level with the help of Allah. So I decided to take things in my own hands and started an adventure in the rain forest made of ink and paper (books). It took me months, then years, and the transformation was gradual, but real alhadulillah. In this article I will share with you one principle that I have learned and which had had a tremendous impact on my level of khushu’. Keep in mind that this point is not magical but it merely has great potential which you are required to distill from it. Trying to embody this point at a deeper level in every Prayer you perform will slowly transform the very meaning of Prayer in your mind. It took years to catch these seemingly simple notions, and lots of investigation, experimentation, and adjustment to reap their fruits. I try to present this principle to you in the most practical form with the hopes you will grab it and make good use of it. I call it the principle of Gratitude. Remember as you perform the Prayer that you are making Allah no favour; it is the other way around: this is Allah’s favour to you. In other words, don’t see yourself at the giving end, i.e. that you are offering Allah something from yourself; rather, place yourself at the receiving end, i.e. the Prayer and the inspiration and ability to perform it is a gift from Allah to you. I understand that this sounds as a straightforward and seemingly obvious fact. It is certainly so, but what hundreds of conversations with people taught me was that most of us understand this notion at an intellectual level. The challenge is to take this notion to heart, allowing it to sink deep down so it turns into a state of being, rather than superficial recognition. You can start developing this state of knowing by bringing it to attention as you are getting ready to Pray. 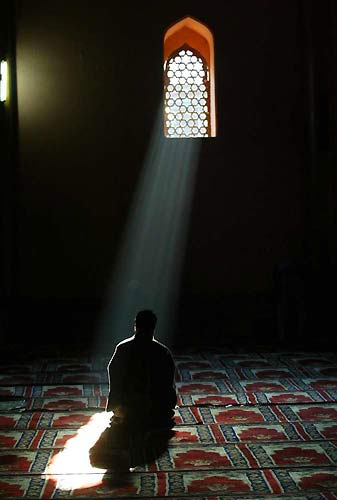 Remember there are billions in the world who know nothing about the Prayer. There are millions who know about it but don’t appreciate it and thus don’t even perform it. There are also millions who perform it in a mechanical, robotic way to the extent that it has almost no impact on who they are. The fact that Allah has designed the Prayer, taught it to Prophet Muhammad (PBUH), allowed it to reach us in full detail, and inspired us to observe it, all reveal a profound divine caring towards us. This realization, when dwelled upon, gives rise to a deep, refreshing feeling of gratitude towards Allah. It awakens in your heart the willingness to return the favour, to express your gratitude, to be appreciative. You feel pampered and well-taken care of. The sequence of awareness, inspiration, motivation, and energized action activated by the realization of this fact is genuine. It permeates one’s limbs and soul. And it is here that your sense of khushu’ will start to take new heights. The more you practice this deep awareness of the fact that as you Pray, you are actually at the receiving end, you will ascend to higher levels of knowing and thus, focus and khushu’. I understand some of you may have a question as to how they go about doing all of this. To me this question indicates they are trying to figure out the process intellectually. My experience tells me that things don’t work this way. There is an original propensity in our souls, and our fitrah (natural disposition) that knows the secret code to this. So all you need to do is follow the steps I described earlier and let your heart and soul guide the way. Let go of your desire to control the situation. Let your soul flow into that state and open up to how it relates to the experience. At the beginning you will attempt to resist, yet you need to just let go. Let your heart dwell on the meanings of the words you are reciting, let yourself flow into that ocean of meanings, relax and let Allah (SWT) lead the way. The more you practice this, the more you will learn to let go, and the more you will discover the new realms of beauty and khushu’ you had been holding yourself from by insisting to be in control. If you do this right, the world around you will start to disappear from your consciousness, it will evaporate, and you will get to a stage where you only feel Allah’s presence and yourself. Don’t hold back, but let your soul yield itself to its Creator and Cherisher. From this state a sense of security and peace will emerge. Allah’s sufficiency will become self-evident, other worldly goals will seem so futile and unworthy, and a realization that you have touched a deeper part of yourself will emerge. Allow yourself the luxury to stay in this state of mind for as much as you can. The more you do it, the better you will become at it. To me this is one of the biggest doorways to developing a deeper sense of khushu’. I have taught this to a few brothers as an experiment, and it seems to work superbly with all. In my forthcoming book on the Inner Experience of the Prayer I provide a more detailed instruction as to how to develop this state more deeply on a daily basis. However, what you have just read is so practical and profound and I pray you will benefit from it. I am certainly interested in your feedback and wish to hear from you about your experience with khushu’ in general and this technique in specific. Peace! 2 Responses on The One Thing that took my Prayer to the next level"
Wa alaykum asalam wr wb, the book is still in the editing process. It will be published soon insha’Allah. We will announce it on this website insha’Allah and it will be also available for sale here as well.